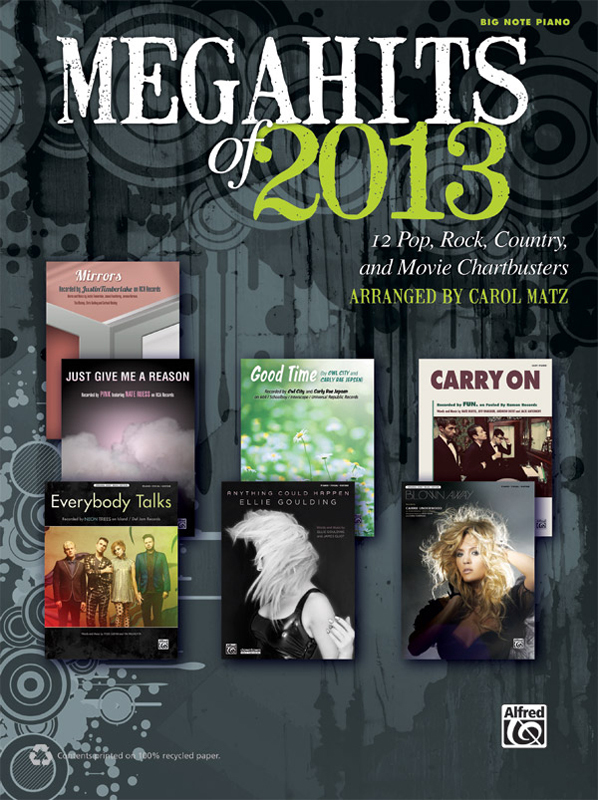 * Leading pop arranger Carol Matz makes a dozen immensely popular songs easy to play! * Pianists in their early years of study can enjoy playing great sounding arrangements of megahits like "Blown Away" (Carrie Underwood), "People Like Us" (Kelly Clarkson), "Mirrors" (Justin Timberlake) and many more. * Titles: Anything Could Happen (Ellie Goulding), Blown Away (Carrie Underwood), Carry On (fun. ), Everybody Talks (Neon Trees), Good Time (Owl City and Carly Rae Jepsen), Home (Phillip Phillips), Just Give Me a Reason (P!nk featuring Nate Ruess), Mirrors (Justin Timberlake), People Like Us (Kelly Clarkson), This is Clark Kent (Man of Steel), Thinkin' 'Bout You (Frank Ocean), A Very Respectable Hobbit (The Hobbit: An Unexpected Journey).